This unusual engagement ring is the perfect combination of ancient and modern, featuring a 0.50 carat oval blue Tanzanite, a gemstone only discovered in the 1960's, and the ancient Trinity knot design forming the shoulders of the ring. 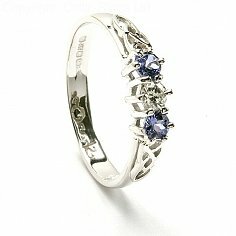 Hand-crafted in Dublin from 14k gold, this beautiful ring has a sparkling diamond on either side of the Tanzanite to make the trilogy design. Inside the band is the hallmark of the Dublin Assay Office, your mark of quality. All diamonds sold by Celtic Rings Ltd are conflict-free.